A University of Wyoming researcher contributed to a paper that determined a “Snowball Earth” event actually took place 100 million years earlier than previously projected, and a rise in the planet’s oxidation resulted from a number of different continents — including what is now Wyoming — that were once connected. Chamberlain is the second author of a paper, titled “Timing and Tempo of the Great Oxidation Event,” which appears in the Proceedings of the National Academy of Sciences (PNAS). Ashley Gumsley, a doctoral student at Lund University in Lund, Sweden, is the paper’s lead author. Other contributors were from the Geological Survey of Canada in Ottawa; Swedish Museum of Natural History; University of Johannesburg, South Africa; and the University of California-Riverside. The research relates to a period in Earth’s history about 2.45 billion years ago, when climate swung so extremely that the polar ice caps extended to the equator and Earth was a snowball, and the atmosphere was largely isolated from the hydrosphere, Chamberlain says. Recovery from this Snowball Earth led to the first and largest, rapid rise in oxygen content in the atmosphere, known as the Great Oxygenation Event (GOE), setting the stage for the dominance of aerobic life, he says. A later, and better known, Snowball Earth period occurred at about 700 million years ago, and led to multicellular life in the Cambrian period, Chamberlain says. The events show there was not one event, but an oscillation of oxygen over time that led to Earth’s conditions today. Chamberlain’s contribution focuses on igneous rocks exposed in South Africa that record the existence of equatorial glaciers and contain chemical indicators for the rise of atmospheric oxygen. Chamberlain’s in situ method to determine the age of the rocks does not require removing baddeleyite crystals from the rock. This process allows for analysis of key samples with smaller crystals than previously allowed. Using a mass spectrometer, the age of the rocks is determined by measuring the buildup of lead from the radioactive decay of uranium, he says. 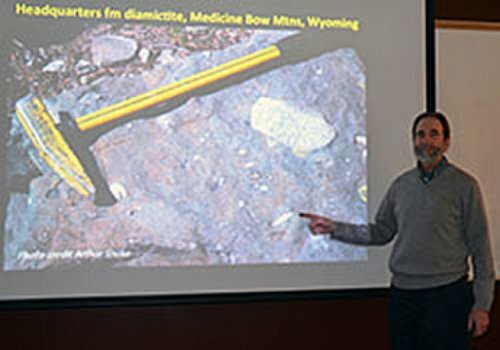 Chamberlain points to a Wyoming connection in this research. From paleomagnetic data, many of the continents, at the time, including the basement rocks of Wyoming, were all connected into a single, large continent and situated near the equator. Other continents connected included parts of what are now Canada and South Africa. This situation is part of the trigger for the “Snowball Earth” conditions. “There are glacial deposits exposed in the Medicine Bow Mountains and Sierra Madre that are from this same event,” he says. “The fact that these sediments were at the equator at 2.45 billion years ago comes from the paleomagnetic data from associated igneous rocks,” Chamberlain says.